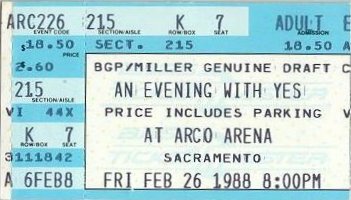 This show was at the old ARCO Arena; the current one opened Fall of 1988. The capacity at the original arena during Kings basketball games was 10,333. When I got to my seat at this show I found my roommate, who had bought tickets seperate from me and roadtripped with different friends, was in the seat right next to mine. The Sacramento show was great very informal and a lot of fun. Flashforward to 1987, a year of "I just died in your arms tonight" and "You gotta fight for your right to party." It also happened to be the year BIG GENERATOR came out, which I promptly bought on the spot. One day, close to Christmas, I was reading the Sacramento Bee and found out that Yes would be coming to town! I decided to buy tickets to the show. While at the store I bought Pink Floyd MOMENTARY LAPSE OF REASON and Jethro Tull, CREST OF A KNAVE. When the show rolled around, I didn't know any old Yes tunes. I think I knew "I've Seen All Good People", but that was about it. On the way, the guy I was going with (some guy from a class) was trying to catch me up to speed, playing CLASSIC YES in the car. Now that I think back on it, he didn't know jack about Yes--he tried to tell me Trevor Rabin joined the band "when they recorded 'I've Seen All Good People'". The next morning I woke up the fanatical Yes fan that I am today.